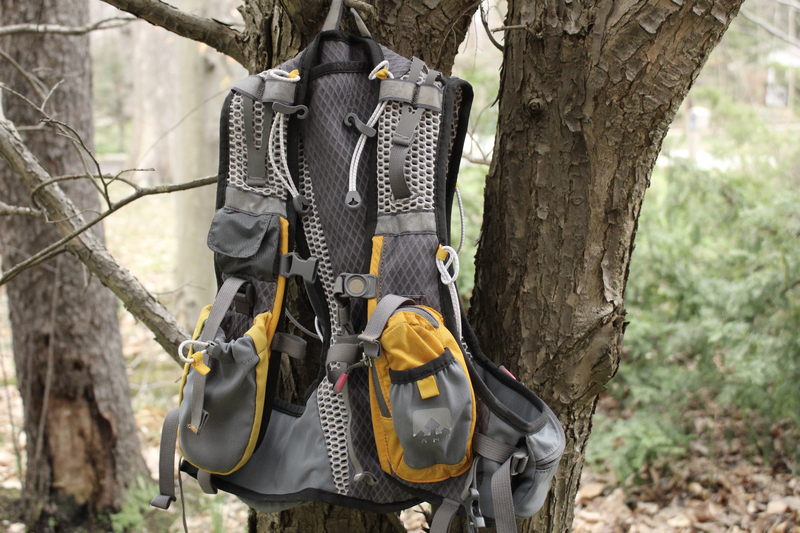 Discussion and questions about hydration packs and bottles are common this time of year. 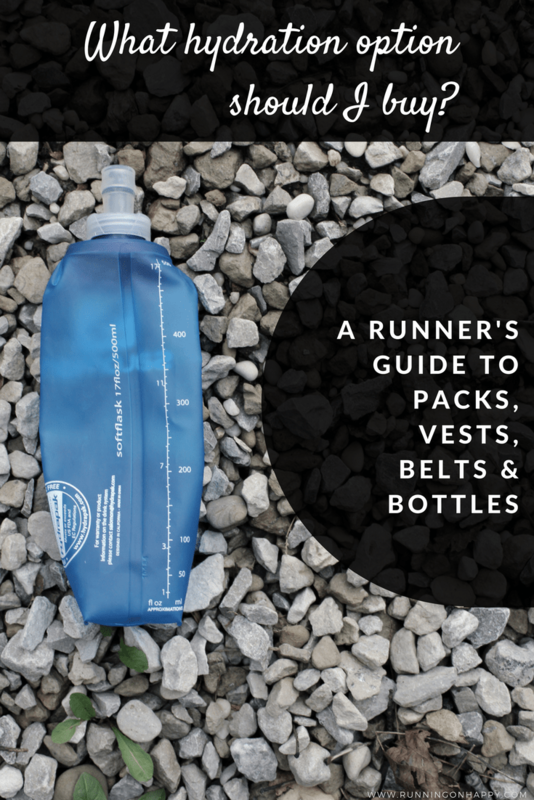 Check out this guide to hydration packs, vests, belts, and bottles. It’s high season for fall marathon training which just so happens to correspond with the height of summer. There are a ton of races approaching in the coming months. I’m in a bunch of different training groups on Facebook and by far the most common questions I see all pertain to hydration. I need more water than my handheld can carry, does anyone have any suggestions? What are the differences of hydration packs? I figured I’d answer these questions and dedicate today’s discussion to all things hydration. I’ve answered several questions about hydration already in the Running Coaches’ Corner linkup — such as why you need to stay hydrated along with a few options to keep you hydrated. Today I’m going to show you a few ways to carry said hydration with you. Bear in mind there are a ton of hydration packs, vests, belts, handheld bottles, etc., on the market. There’s a variety of sizes, styles, colors, and brands to choose from. I’ve found, much like fueling, shoes and apparel, what works for one person does not work for the next. The best thing to do is examine all your options available and determine what your needs are and what style of hydration suits you best. I use my Salomon Soft Flask for very short runs. It’s just the right size for short runs, plus since it’s collapsible my hand doesn’t cramp up like it does holding a rigid bottle. I also like it because I don’t necessarily have to bite down on the valve to get the water to flow. I can basically just squeeze it and I get just enough fluid to quench my thirst. It’s also the perfect size and shape to toss in the front of my larger pack, which I’ll show you below. 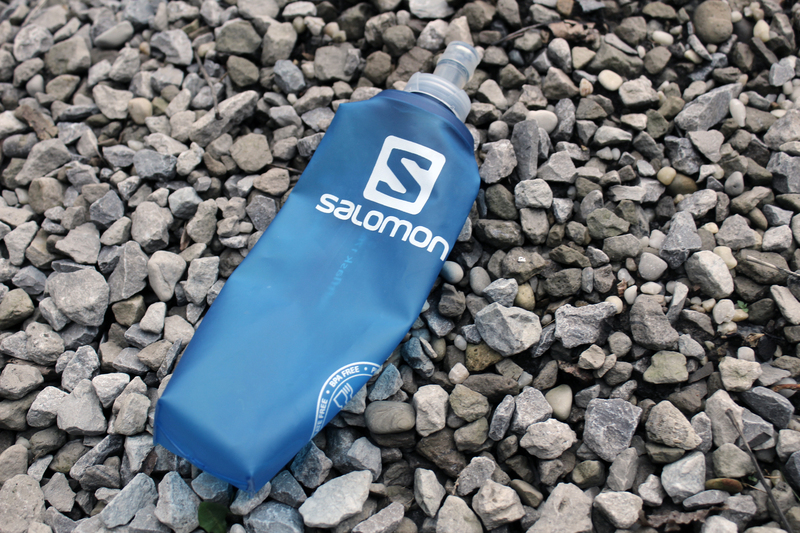 Buying tips: find something easy to grip or with a strong hand wrap to keep the bottle snug while running. Some people really dig having pockets for fuel and keys as part of their handheld bottle setup. I spent many a race in close quarters with my Nathan Trail Mix Hydration Belt. I love it… and kind of hate it… When I first got it, I did so because I frankly didn’t know any better. I knew that runners wore hydration belts, and I knew that I wanted to be in charge of my own hydration on race day and not rely on the aid stations. There are two flawed topics in that sentence. The first being that not all runners wear hydration belts (as you’ll soon see in the following bullets), but secondly, why not rely on the aid stations? It’s the training runs you need to worry about — not necessarily race day. I have a love-hate relationship with my hydration belt. It’s gotten me through some mighty tough runs and I foresee myself wearing it a bunch more this summer. I’m glad I have it. What it’s good for: running with a canine companion, shorter runs, long runs up to a full marathon in addition to aid stations. Buying tips: Find a belt that fits snugly with little bounce. Don’t be nervous to test it out in a store by running around. Helpful hint: the bottles and belt become infinitely heavier when filled with liquid. My friends know I’m slightly obsessed with my Orange Mud packs. If I had to choose a favorite OM item (which I won’t because I love them all — duh), it would be the HydraQuiver Single Barrel. It’s just the right size for a long run on a cool day. This vest has plenty of pockets for storage. I can fit my iPhone 6 in the shoulder pocket plus fuel in the other one. There’s a larger pocket for additional fuel or supplies, an audio port for earbuds in case you place your phone in the larger pocket, plus a key holder so you don’t lose your keys on the trail. All of Orange Mud’s packs are super easy to clean, too. They’re meant to get dirty and beat up. The HQ single is my go-to hydration option of choice. What it’s good for: all distance runs in cooler temperatures. Up to 9-13 miles in warmer months depending on your hydration needs. 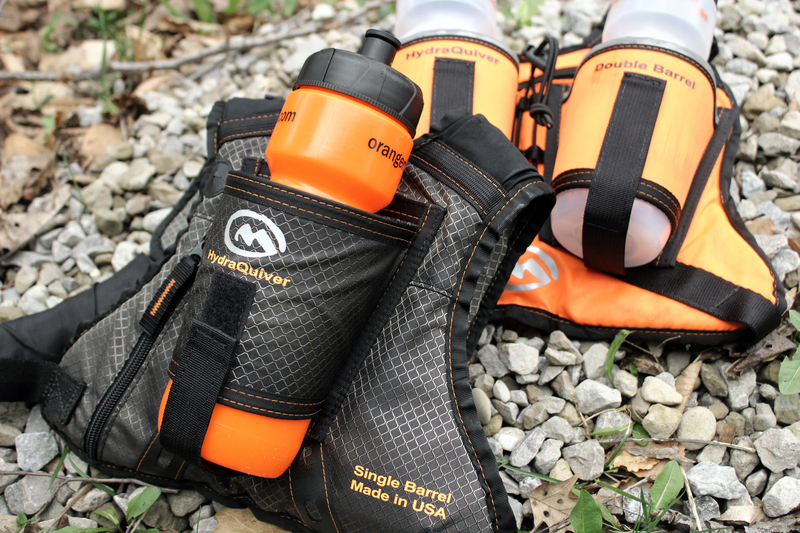 The HydraQuiver Double Barrel hydration pack is the same body style as the single. It has two bottle holsters and the back pocket is quite a bit larger. It also has bungees on the back for additional storage. I use the bungee when I shed layers in the summer. It’s easy to cinch a shirt or do-rag on and go. This is my go-to vest in the summer when I’m training and need a lot of fluid. The very best part of the Orange Mud bottle system is the ease of cleaning of the bottles. (The vest, too, though.) My biggest complaint about the bladder system is how difficult it is to get it thoroughly cleaned. With bottles, all you do is unscrew, wash, and you’re done. Another nice thing about the double barrel is the option to have water in one bottle and electrolytes in the other. With the single or a bladder, you only have one beverage choice. What it’s good for: all distance runs. My very first hydration vest was the Nathan VaporShape. I love it. It’s great for super long runs. It’s got a huge reservoir, tons of pockets, and fits snug as a bug. It definitely did it’s job when I needed it most. I wore it through some tough training runs for the 2015 Cleveland Marathon. Unfortunately the bladder system isn’t necessarily my cup of tea. I have a hard time with the bite valve. Now, having said that, I’m still madly in love with the backpack itself. I’ve used it on more than one occasion without the bladder for day hikes, canoeing trips, and even to an event in downtown Cleveland. There are a ton of pockets which is one of my all-time favorite features of the VaporShape. Plus it fits really well — like it was made for my body. Oh, and remember the hydrapak soft flask? It fits perfectly in one of the front pockets. What it’s good for: runs longer than 10 miles. Note: the VaporShape is no longer available. Fortunately Nathan has a plethora of hydration packs that are similar and I’m sure just as comfortable. Buying tips for vests and packs: determine if you’re a bladder/bite valve person or a water bottle person. Also consider the pockets and ease of accessibility while running. All important factors when choosing a hydration system. Helpful hint: if you’re running with a hose and bite valve in the winter, blow back into the tube after you’re done drinking. This will help keep the valve free of ice back up. Vests and hydration packs tend to get pretty pricey rather quickly. My suggestion is if you can borrow one from a friend to try before you buy, do it. If you can’t, head to your local running shop and see what you can find. In my experience, I haven’t found much I love in the brick-and-mortar store. I think more runner-friendly communities have a better selection. But if you’re like me and can’t find what you’re looking for in a store, look for a vest or pack from a reputable company that you’re able to return or exchange just in case it doesn’t work for you. There are tons of options available. It will take some trial and error to find what works for you. I hope this post helped you if you’re struggling to determine which hydration option is best for you. Like I mentioned, it’s all really individual and personal preference. As you can see, I started with something that was so wrong for me and I tried several options before I finally found a pack I really like. It takes a minute. Be patient. And if you have any questions, please don’t hesitate to contact me or leave a comment below. I’m happy to guide you. Don’t forget to link up with Debbie, Lora, Marc, and me for the Running Coaches’ Corner linkup. It’s been a fun link-up and we love reading what you have to say! So, which hydration packs or bottles stand out to you? What’s your current favorite hydration option? Linking up with Nicole and Annmarie for Wild Workout Wednesday! Ive never heard of the soft flask before- that looks like it could be a good options for shorter runs. I prefer to wear a hydration pack rather than a belt. If I need something for a shorter run, i will bring a handheld although they can get kind of annoying to carry after awhile! I’m not a big fan of a handheld. I like having my hands free and I don’t like the idea of being “tied down” to something for a few miles. I love my vests, though. Love. I absolutely LOVE my Ultimate Direction Mountain Vesta. The soft bottles are amazing and the vest stays put. I can’t stand hydration belts just because I’ve never found one that didn’t bounce. I use a Nathan handheld that is great too. I have a friend that uses UD and loves it. Looks super comfy! If I didn’t already have three vests (yowza), I would probably consider getting one! Not going to lie… I am a bad example and don’t carry hydration! I am super lucky with being on the lakefront (with water fountains). I can’t do the sloshing! I have friends that don’t run with hydration, even if we’re running over 6 miles. I don’t get how! And our water fountains are shut off in the winter so if we’re running far and need water, we’re SOL unless we carry. Having broken up with my fuel belt last year, I’m still kind of at a loss. I’m not terribly satisfied with any of my options when it comes to runs over 10 miles. The packs are so pricey it’s tough to bite the bullet and try one. I agree, they are expensive. They’re more of an investment. I found my VaporShape from a fellow INKnBURN ambassador who was upgrading hers so she sold it to me used. Maybe look around and see if anyone is selling so you can buy a more inexpensive version first. Or just find a place that will take it back if you don’t like it. Hydration on the run is something I need to work on! I have a Nathan handheld but it’s a bit too big, so I’ll probably eventually get a smaller version. I don’t think I could run with a vest or hydration belt! Vests are surprisingly comfortable. You don’t even notice them once they’re on really. Really great tips! I have the same Nathan belt and I have shied away from it because the bouncing is just out of control. It’ll be fine when I start and just way too light when I finish my water. I’m using the Orange Mud Hydraquiver and it’s my favorite, but when I sweat, it gets inside the pack and gets my phone wet. The velcro also usually messes with my hair, lol. I may have to look into the VaporShape – it looks a lot more comfortable! I put my phone in the shoulder pocket. It doesn’t get wet there. And I had the same problem with the velcro and my hair. Somehow I eliminated the issue, though. I can’t remember how? If I remember I’ll message you! I love the HQ, though. Once I figured out how to position the bottle I never looked back! I LOVE the pocket in the fuel belt. It’s huge. Phone, keys, fuel, dog bags, extra TP — you can fit everything in there. I have the soft flask/ultimate direction holder but I still struggle with it until the bottle empties a little. It’s hard to get a good grip on it. Believe it or not, my favorite is still my hard 24 ounce Tailwind bottle. I put a soft kozie around it and use a bottle band. It’s kind of homemade, but it works the best for me on those long runs. Sometimes I carry 2, one in each hand. I can’t do a waist pack for the same reasons as you, and I’ve never done a vest. I highly recommend a vest. It’s a game changer! I used to wear a fuel belt but for runs over 10 miles, it really messed with my stomach. I’ve been carrying water on almost all of my runs again since the heat is creeping back up in Florida. I just carry a small bottle that would fit in a belt. It isn’t so big that it is annoying. For longer runs…I just drop a few of those off in a convenient spot so I don’t have to stop for more than a second. The belt really digs in and makes my stomach hurt, too. But I know others who swear by it. I can imagine your need for hydration in FL! So many good choices! I’ve used a belt in the past and liked that. Better yet it being able to stash a bottle somewhere. I received a CamelBak hydration pack for Christmas, and am loving it. I use to use a hydration belt, but am finding that I like the backpack much more. I feel the same way. I use my packs so much more than I ever used my belt. I wear a belt and also have a bottle that fits in my waistband. I would love to try a pack. My friend has this awesome bottle that sits in the back of her shorts. I wonder if it’s the same one. I may get it because it seems so much easier than carrying something! It is from Simply Hydration I think. I quite like it. Just have to be careful not to overfill or water will squirt out the top! Not so bad on a very hot day! Haha I’ve had that happen to me as well. Surprise! I ran with a Nathan belt in the past during my long runs but like you it’s a love/hate relationship. Currently using a the Nathan speedflask handheld. I was at REI yesterday and looked at their hydration vests – I want one for my trail runs. I also saw the Nathan’s soft flask with a hand grip. Like the idea of a soft flask and may have to try that one. You’re right about the costs though – vests are expensive!!! I love my camelbak hydration backpack. The only problem is that a lot of races don’t allow backpack hydration packs, so if I use it during training, I have to have a clear plan of attack for race day. I haven’t found any issue with backpacks and racing so far. I must run smaller races than you! I go round and round with hydration…..I detest the constant sloshing of handhelds, but I’ve gotten to where I can tolerate it. Belts never fit me properly. I was offered a similar vest (from SLS3) at a discounted price (in exchange for a review) and I was pleasantly surprised how much I liked it! I only use it for long runs (on hot days) because I really don’t need all the water it can hold. It has a back pocket (suitable for a drop-in bladder), but YUCK…not gonna use it for that LOL I prefer to use aid stations for a race, though, I did use my 8-oz FLEXR (handheld) for Route 66, and it worked well (refilling it at aid stations as needed). Previously I used a belt but I stopped using it a little over a year ago. I really like using my Nathan handheld for short and long runs. I’ve never tried running with a hydration vest/backpack. Last year I found out that the NYC marathon doesnt allow hydration backpacks so I was happy that I was comfortable with my handheld! Ah that’s a bummer. I knew some of the bigger races didn’t let vests in. Thankfully I haven’t run into that issue yet. I have that same Orange mud single barrel one and I used to use it all the time, but I did feel like it felt very heavy when the bottle was full. I have got a Nathan Firecracker vest since and I like that much more because there are two smaller bottles that fit in the front, and it feel lighter. Maybe it is just the way the weight is distributed. Really? That’s interesting. I feel like the HQ is one of the lighter options I’ve tried. I haven’t tried the Firecracker! Great post! I’ll be bookmarking this for the future! I have never seen that soft flask before- I am trying out a new Nathan handheld now- so far so good! That’s great! I don’t have a legit handheld. I like having my hands free. I despise carrying hydration. I currently use a Nathan handheld, which is fine, but I really prefer to stash it somewhere on my route (like my front porch) and then just make loops around to grab a drink when I feel like it. So lazy LOL! I have a hydration pack and I hate it. I thought I would prefer not having to hold anything, but it moves around and annoys me. My amphipod handheld has become like an extension of my hand. I run with it so often that I feel weird when I don’t have it. I’m pretty sure I’m more of a bottle person then a bladder/bite valve person, but really I’m more of a “loop” person so I can just carry my small bottle. LOL. Lol! I have a friend that carries her handheld everywhere and loves it! So I really need that Solomon bottle – I love that it is so squeezable and doesn’t cramp your hand! Pinning! This is such a great guide! I love my Fitletic handheld but that Salomon soft flask looks awesome too! It’s a nice addition, for sure. Plus you can kind of scrunch it up when it’s empty and tuck it into your shorts! Great post! I do really love my SPibelt Venture series hydration belt. Very comfortable but only hold about 20 ounces of water. I’m currently trying to figure out how to refill at an aid station at grandma’s with more Tailwind when I run out?? Hmmm. May have to wear another spibelt to carry the extra Tailwind. But, I must say… I’m not all that happy about having to refuel and mix at an aid station – I’ve got goals girl and every couple minutes makes a difference. HA! I don’t carry hydration, I usually run in the park which has fountain, they are turned off now and i have regretted not having a drink a few times. I just tell myself I can handle it and train harder (less water) than I will get from aid stations on race day! Where do you run that there’s water fountains?! The metroparks don’t have any :/ Hey are we running soon? North chagrin has two along the path, about every two miles!! I carry a small Amphipod water bottle in the large side pockets of my shorts or capris for fueling on long runs, and then rely on water fountains for extra water or a handheld for really long runs if the water fountains are off. I can’t stand feeling something around my waist or shoulders, so I don’t race with anything and just drink from the aid statons. I don’t mind it, especially for long runs. If I’m racing hard I rely on aid stations only because I don’t want the hassle of fumbling with my water bottle. Stay Hydrated and Happy With These Delicious Beverages! I’m still working on my long run hydration (I should say re-working). I have always carried a handheld, but switched to the Nathan insulated flask last year. I love the insulation and the smaller size is great for my newly arthritic hands, but it doesn’t hold me over for long runs or the heat. I’m trying out the Nathan fuel belt right now. It’s pretty comfortable and I like that I can take one of the bottles off (and still carry one in my hand). I do like the little pack on there too. Ha! I was the same way with the packs when I first started wearing them. But after about 5 minutes I stopped noticing the sloshing. With the bottles I don’t hear it at all! HelloI wear a belt and also have a bottle that fits in my waistband. I would love to try a pack. I can’t do the handhelds. Drive me batty! I prefer to leave water at my car and then loop my long run. The softflask is a new to me product! I still alternate between a handheld (for shorter distance) and my orange mud pack (for longer distances). When I purchased the Orange Mud pack last year I was afraid that it would get on my nerves if it bounced a lot but to my surprise it really does stay in place! It’s amazing, isn’t it??! Never budges. I love this! I have been using a hydration vest because it’s so hot during the summer here for marathon training. 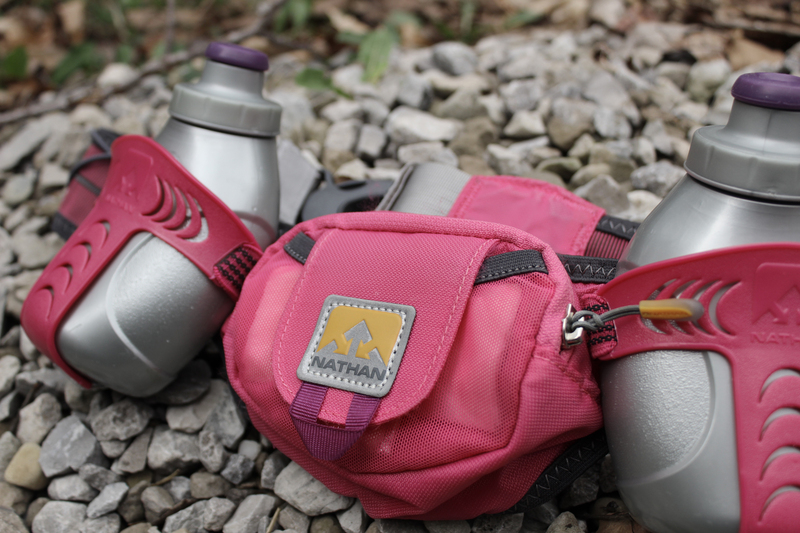 Found out you can’t use them in the marathon I’m running so now I’m thinking of doing the Peak Hydration Waist Pack by Nathan to carry my electrolytes and just drink water on course! Hoping it works well for me! I’m sure the water on the course will be fine. A lot of people don’t carry at all for half and full marathons and then seem to do just fine! I like being hands-free on my runs, so I’m all about a hydration backpack. I have a Camelbak and love it. I like being hands-free, too. I don’t love the handhelds but I know lots of people swear by them! I’ve never ever carried water with me… I run early, run late, or make a quick pit stop when there’s a water fountain around. I typically don’t run long enough to need water (I hydrate pretty well throughout the day too)… But I’m thinking about signing up for a longer race, so maybe I’ll have to start thinking about hydration with me. What’s the longest distance you run without water? If there’s water on my route I don’t carry but I don’t have a lot of water fountains on my routes. Plus when it’s hot and humid I’d rather know I have something in case I need it. So I’ve never carried water with me..
I’ve done 18 mile runs without water. It’s not something I’ve ever done in 19+ years, so I just don’t. Wow. I think the only time I could run that far without water is in the winter. But even so, I lose a lot through sweat and end up feeling pretty bad so I carry it with me any time I’m running over six miles. I’m a huge fan of my handheld and then my hydration vest for longer runs! I can’t get on the handheld train. I tried! I just really like having my hands free. This was super helpful! I’ve just started doing longer runs and so far my technique has been to leave a water bottle outside and pass by my house! I do like soft hydration bottle but I also don’t like to carry things. Hmmm…things to ponder! If I have to loop back I tend to get a little bored and irritated. I try not to loop back to a place I can easily stop! I love my Salomon. I use the soft flasks and the bladder depending on the mileage. I can put everything in there. Gels, chews, keys, heck even a sandwich if I need it! I had a camelbak but it moved too much. Gave up on belts long ago – they just irritate me!